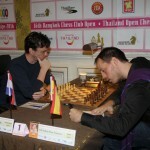 German Grandmaster Jan Gustafsson caught leader Dutchman Loek van Wely to be joint pacesetter after Thursday’s sixth round of the 16th Bangkok Chess Club Open, South-East Asia’s strongest tournament of 2016. Top seed, Spanish Grandmaster Paco Vallejo made a valiant effort to take down van Wely but a wild struggle ended in perpetual check and a draw. This gave Gustafsson the opportunity to move up should he defeat Chinese teenager Nie Yinyang and the German Grandmaster made no mistake to reach five and a half points. 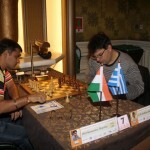 Van Wely’s compatriot Benjamin Bok had a chance to reach the tie for first but failed to convert his advantage after heroic defence by India’s Dhopade Swapnil in a marathon game which lasted for 78 moves. Former world title challenger Nigel Short will not retain his Bangkok CC Open title after a shock sixth round loss to Myanmar’s Wynn Zaw Htun. This was Short’s second match of the day, after losing a Thai chess-boxing contest against France’s Sophie Milliet earlier in the day. Certainly Short’s play against Htun showed clear signs of possible concussion from the earlier bout. 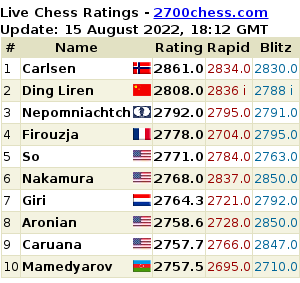 Two Thai players moved to within a point and a half of the tournament lead. Wisuwat Teerapabpaisit defeated Australia’s Alain Pardoen while 21-year-old Thanadon Kulpruethanon outpointed Dominique Lourain. 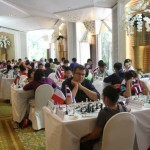 Round 7 of the Bangkok CC Open begins on Friday at 2pm at the Dusit Thani Hotel. Admittance is free for spectators.